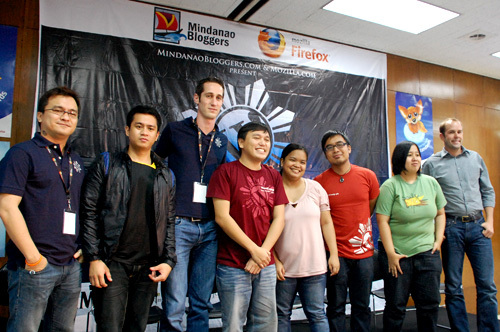 Wordcamp Philippines 2009 was great. It was informative and educational for WordPress users of any levels. All three Wordcamps that I’ve attended had a representative from Automattic, the company behind WordPress. Alex Shiels was there at Wordcamp Melbourne in 2007, Matt Mullenweg was here for Wordcamp Philippines 2008 and this year, it was Beau Leben. He was joined by Seth Bindernagel and Gen Kanai, the guys from Mozilla, who co-presented Wordcamp this year. However, the best part came afterwards. After a full day of geek-talk, we retreated to Whistlestop for post-Wordcamp dinner with the speakers, organizers and volunteers. We had the usual Pinoy favorites: pork sisig, crispy pata, sinigang na baboy, kare-kare, chicken adobo in gata and Whistlestop’s bestseller, the buffalo wings. 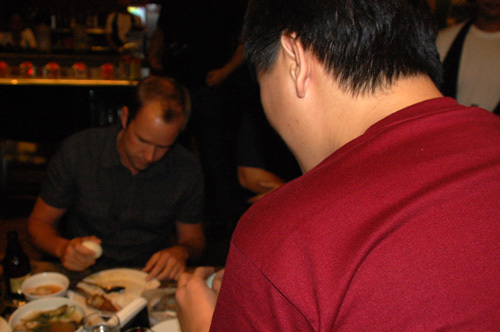 The three guests enjoyed the greasy and utterly sinful dishes, especially the sisig and the crispy pata. The most memorable, however, was the balut. 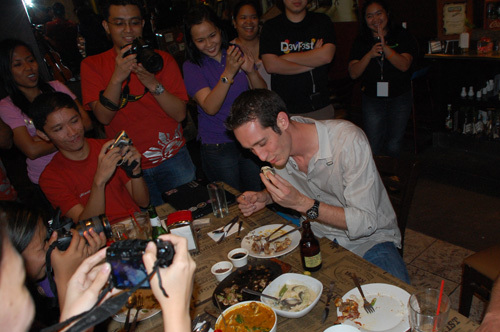 It seemed like every foreigner who visit gets badgered to try the balut when traveling in the Philippines. I’ve done it to a couple of guests, even if I don’t eat it myself. Gen, having grew up with a Filipina nanny knew all about balut and managed to escape having to try it by leaving the table. Seth was eager to try it, while Beau was clearly not sold on the idea of eating duck embryo. However, when the balut was handed to him and all the cameras came out, he balked under pressure and subjected himself to this Philippine streetfood. Beau about to take a bite, and the bloggers all snapping away. More pictures of this uh, momentous event are up on my flickr. 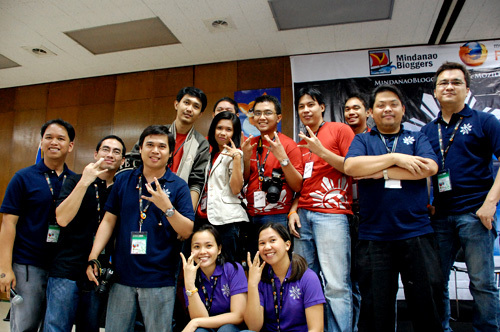 A huge congratulations goes out to Blogie, the Mindanao Bloggers Society and the rest of the Wordcamp organizers and volunteers for another awesome WC this year. Looking forward to 2010! Thanks to Bourdain and Zimmern, balut is one of the foods dare not try .. I prefer the Penoy than the Balut Egg. I still can’t learn to eat the embryo! :p Hands down to the ones who were able to eat it! Wow! Hi there! Thanks for the link… The balut moment was really nice…. WordCamp this year was smaller compared to last year’s, but it was just as fun, wasn’t it? Out of Town Blog: fail ka. Melvin: Saya ng Wordcamp no? AudMraz: But…but.. it’s.. uh… a great travel story to tell? Maki: Penoy for me too! Blogie: Smaller, but it’s more manageable. Congratulations on another successful WC, Blogie!